Will the Graphite Industry Take Off? The Investing News Network recently had the chance to catch up with Simon Moores, Managing Director of Benchmark Mineral Intelligence. The use of graphite in lithium-ion batteries has been a huge topic of discussion over the last couple of years and, of course, Tesla Motors (NASDAQ:TSLA) is one of the biggest driving forces shedding light on the critical metal. Naturally, this has ramped up interest in graphite, and with its wide range of uses—from everything to laptops, electronic devices and electric cars among many other things—demand is continuing to grow. Below is a transcript of our interview. It has been edited for clarity and brevity. Read on to see what Moores had to say. INN: You mentioned in a May blog post that you expect graphite demand to more than treble in four years. What are the biggest drivers of that change? SM: Lithium-ion battery uptake across the world and in many areas of our lives are no doubt the biggest driver of this change. The emergence of pure electric vehicles and stationary storage, particularly in China, is reshaping the way we use and store energy and this is having a major impact on lithium-ion battery raw materials, especially graphite, lithium and cobalt. INN: China is once again being targeted for unfair export restrictions, including graphite, as you have noted. How could this affect the graphite market? SM: Overall, I expect it to have little impact on the flake graphite raw material but it could have a wider reaching impact on value added products. China tends to dominate these situations economically and suspect this will be the major factor. INN: You also wrote about droughts in China having an effect on graphite production there. Since China is currently the world’s largest flake graphite producer, what does this fragility of production mean for global graphite supplies? Should investors be supporting projects elsewhere? SM: I have spend the past few weeks in Shandong to experience this first hand and it is no doubt having a negative impact on those processing and mining companies operating there. The more serious trends shaping the graphite industry however is the price performance of flake graphite over the last two years which has pushed higher cost miners and processors in China out of business. This is capacity that has indefinitely come off stream and will have an impact when flake graphite’s industrial markets rebound. The second is the pollution situation – air and ground – that has impacted local communities in Shandong, China’s historical graphite producing area. Both of these economic and environmental factors have forced more than half of the regions graphite companies to close since 2012-2013. There is still mining in the area, however, but at a very low level with the majority of flake being transported from Heilongjiang to Shandong’s processors. INN: Why does most of the world’s graphite come from China? SM: It’s a function of geology and markets. Some of the world’s largest flake graphite deposits are located in China’s north east. The country also has an abundance of smaller flake graphite deposits in the central provinces. Meanwhile, China’s sprawling steel industry between the 1980s and 2000s ensured a localised market for the product and this resulted in many many graphite mines and plants opening up shop in the 1980s. As a result, many higher cost flake mines in the rest of the world closed. This is slowly changing, however; many mines in China are no longer low cost (sub-$400 per tonne) – as seen with Shandong – and are slowly closing one by one. The grades in China vary: from 3 percent to 5 percent in Shandong to 10 percent 15 percent in Heilongjiang. However, Heilongjiang only has medium flake graphite while Shandong’s deposits also have a good proportion of larger flakes up to +32. 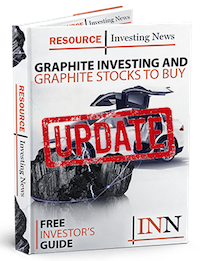 INN: What other trends and catalysts can investors watch out for in the graphite industry this year? SM: The value added trend is something to watch closely. While flake graphite’s overall price has been depressed in recent years, many companies in Europe and the US have made good margins on specialist, value added products such as expandable, spherical and micronised graphite. Expandable graphite – a flame retardant – is seeing strong growth prospects as more environmentally damaging alternative such as brominated products are being outlawed. Meanwhile, the demand for spherical graphite is going through the roof. Last year, Benchmark Mineral Intelligence tracked the total battery anode market as 80,000 tonnes, 52,000 tonnes of which was natural spherical graphite. This year that overall market will growth to 100-110,000 tonnes with natural spherical cementing its dominance over synthetic graphite. These value added products are offering a completely different business prospect to flake graphite raw material. It’s a value game. INN: Do you still believe that demand for graphite will increase by 200 percent in the next four years? Why or why not? SM: We believe the lithium-ion battery anode market could grow to at least 250,000 tonnes by end-2020. If you visit China and speak to these lithium-ion battery producers, something we do at Benchmark, then you realise how much growth the companies are planning for. One such meeting I had recently resulted in the company more than trebling its output to 10GWh in under two years. We saw the plant and the new expanded area under construction. This equates to 12,000-15,000 tonnes of spherical graphite which is derived from 26,000-33,000 tonnes of flake graphite. This is just one example of how China is forcing change in the industry. It’s not just about Tesla and its huge gigafactory: over 70 percent of new lithium ion demand is coming from China. We are already seeing the impact of this growth on Uncoated spherical graphite prices which are up 10 percent this year. Hi, I uncovered your web site by using Bing although buying equivalent theme, your web site came in place, it seems like excellent.. us geo-targeted and niche targeted mobile traffic I’ve got saved for you to my favourites types|included with this favorites.